I have not had a new entry since late March and a lot has happened between then and now. A LOT – LIFE CHANGING EVENTS. Yes, I, the crazy dog lover who goes to the dog park every single day and has had a dog her whole life, was attacked on March 31. Very long story short, my neighbor’s dog got loose and she was not home. I was on the sidewalk in front of her house deciding what I should do when the 150 pound Rottweiler mix lunged toward me. He seemed to be going for my face but I blocked him with my arm. Thank goodness because muscles were actually hanging out of my arm when it was over. He actually got my arm and leg a few times. Thank goodness for another neighbor, who in spite of having a baby in a Snuggy on his chest, beat the dog off me because the dog was not going to stop. Unfortunately, my daughter, who is now 13, witnessed the whole thing from maybe 10 feet away. We both still have nightmares. Mine often include seeing her face watching the attack. Thank goodness it was me and not Andi. I did end up with five stitches in my arm, a nasty infection, permanent scars on my arm and leg, a little bit of nerve damage and a new fear of strange dogs. Yes, the neighbor is taking care of things through her insurance and the dog no longer lives on my street. My son had been complaining for a few weeks about pain in his leg. It first appeared as a pulled muscle in his thigh but it kept getting worse and seemed to be spreading. I took him to the pediatrician who after blood work and x-rays told me it was growing pains. My gut told me it was much more. I scheduled an appointment with Commonwealth Orthopedics in Northern Kentucky hoping they would do a MRI. They refused to do the MRI saying it would be emotional for him and that it was just growing pains. Again, my gut told me it was much more. He literally fell to the ground the next morning when he tried to get out of bed. I called the pediatrician insisting it was more and was finally given a referral to Cincinnati Children’s Hospital Orthopedic Center. At this point, I was convinced my son had Muscular Dystrophy. His leg literally dragged behind him, he didn’t want to do any activities at all and eventually started using crutches. The doctor at Children’s took it serious, agreed it was much more than growing pains and scheduled an MRI for the next day, Saturday, April 21. Within five minutes of leaving the MRI, they called and said they saw something and figured it was just an infection. The woman told me we’d need to see the doctor early in the week for an antibiotic. I was so relieved to know they had an answer that I cried of joy. That quickly changed on Monday, April 23. He was recovering extremely well for two weeks. We sent him back to school in the wheel chair on a Monday. He came home tired but I figured that was expected. He ended up screaming out in pain all night. It was awful. We called the doctor the next morning and went in. Our orthopedic wasn’t there but another one came in to see Joe. At one point we were told he was going to be in a hip spica cast which meant he wouldn’t be able to sit up, go to the bathroom or anything on his own. I once again was in complete shock. Luckily there was a nurse named Kelly who was a true advocate for my son. She asked all the right questions and demanded tests that made the doctors realize the cast wasn’t needed. Apparently he had a nerve issue from a piece of the graph that had moved and hit a nerve in his leg. Seriously??? He would just scream out in pain over and over again. He was admitted to the hospital for five days where they ran more tests and tried to manage his pain. I finally just asked to come home and manage the pain myself. After nine weeks in a wheel chair, Joey now uses a walker. He even took a few steps on his own today. He should be able to walk normally in just a few weeks. He probably won’t ever be able to play sports but we don’t even care about that at this point. We have come so far. Unfortunately, LCH can reactivate at any time and in any part of the body. The treatment could vary from surgery and steroid treatments to chemo and many other invasive treatments. Luckily there is only a 33 percent chance it will reactivate in Joey’s bones or skin. It’s a very small chance that it will infect his organs (Thank God). Joey will have regular scans and tests to check for LCH. Joey did develop a talent through all of this. Thanks to my co-worker Amy for delivering library items and Artie’s Magic Shop in Covington, Joey has become a magician. He has a lot of fun showing neighbors, friends and family his tricks. So in the midst of all this, my daughter Andi officially became a teenager on May 28. She had three friends stay the night and had a cake decorating contest. I think it just made me feel older. So now that you are all caught up… I will try to post regularly and keep my posts much shorter. I have been dreaming about adding to our family for years. It was just never feasible. One apartment didn’t allow for it or have the space, another just had way too many steps to deal with. But now that I own my own home, I thought it was the perfect time to add to our family. I announced to my family that I was ready to adopt. My parents and children were all surprised but very excited. I talk to some friends about it and they helped me search for the perfect fit. I brought my new 7 pound baby home yesterday. 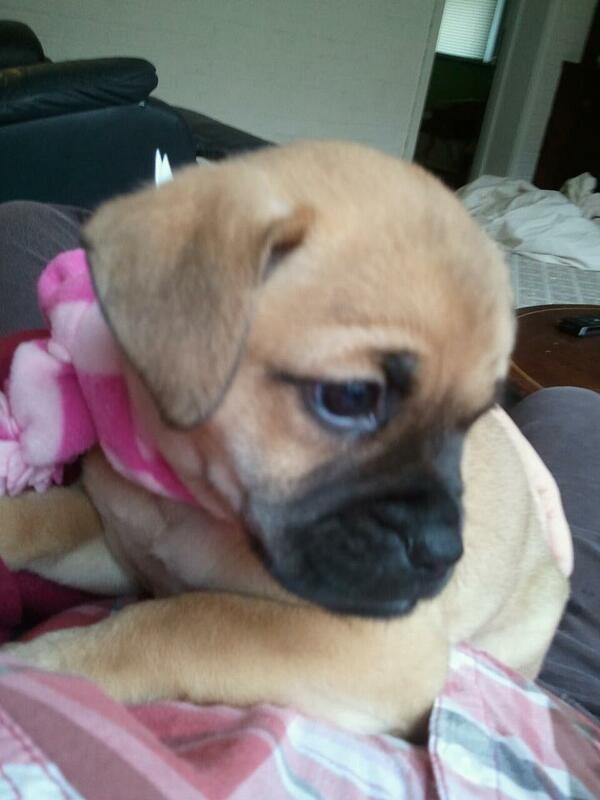 Scout, named after the lead female in “To Kill a Mockingbird” is a rambunctious little Puggle – a Pug/Beagle mix. She is beautiful and sweet. I am head over heels in love with this little puppy. I met the 10-week-old perfect pup on Monday. On Tuesday the kids and I prepared the house, set up her cage, bought her toys and food and basically baby proofed the house. I was able to bring her home from the animal shelter on Wednesday. $80 included my beautiful new baby and covered her first set of shots, license and spaying. She was exhausted by the time we got home. She crawled up behind me and fell asleep between my neck and the top of the couch. That might have been the cutest thing ever. She has been sleeping a lot but when she is awake she is ready to PLAY. She picks her ball up with her mouth, tosses it and then chases it down. It is so funny. I do kind of feel like I have a newborn. She was up at 3 a.m. with poop and pee in her cage. Luckily it was on the pee pee pad so I just changed it, took her outside and put her back in the cage. She cried for about 15 minutes and went back to sleep. But then she was up at 6 a.m. ready to play. I felt like the most horrible mom when I left her locked in her cage today so I could go to work. I really felt like I did when I left my children with a sitter the first time. Luckily my parents are going to check on her today. My children are so happy. My son can’t stop hugging me and my daughter just smiles and giggles. Hopefully the excitement doesn’t wear off because I am definitely depending on their help with our little girl. Now it’s the fun part… I have to house break her. She’s already pooped and peed in the house several times. She doesn’t like the cold, wet grass on her paws and just shakes when we are outside. I’ve had animals all but the last 12 years of my life but never had to train an animal because my father always did that. So I need your advice… How did you train your dog? What’s the best book out there? And how do I keep the kids excited about this new adventure?